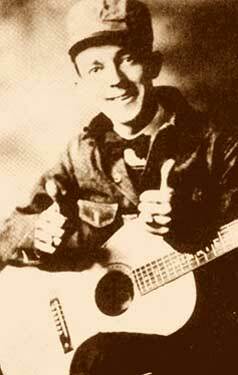 Jimmie Rodgers (1897-1933) is one of the biggest sources of inspiration for all the (country) yodelers in the USA and around the world. In the thirties, under his influence, yodeling became almost synonymous with country music. He was born and raised in Meridian, Mississippi, and worked on the railroads. After catching tuberculosis, he moved to North Carolina, where the mountain air was cleaner. He played music since a few years but was recorded for the first time during the famous Bristol sessions by Ralph Peer in 1927. Here are his first songs from the 4th of august 1927. The recording session wasn’t without problems: Jimmie Rodgers came there with his band, the Tenneva Ramblers, but they broke up the next day. 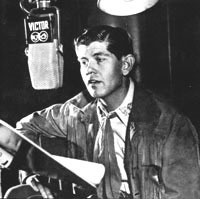 Ralph Peer did then a solo recording of Jimmie, but he was just a singer without a band, and with a guitar, and with a very limited “old timey” repertoire: he could only come up with two songs, the ballad The soldier’s sweetheart, inspired by the dead of a friend in World War I (without yodel) and a 19th century lullaby, Sleep, Baby, Sleep (with a lazy yodel). These song were released with little promotion but they attracted attention and Ralph Peer decided to do a second recording session in november. And now, some traditional yodel, from where it all began in Switzerland (even if that’s not so true, but the whole story is for later). There are different types of yodels, depending on the region. I’ll begin with a very simple one, the Jüüzli from Muotatal in central Switzerland (in the Schwyz canton). It was used to call the cows in the mountains or for milking, and for other activities of the everyday life. Chueraiheli by Erasmus Betschart was recorded in 1979 by Hugo Zemp in the Wassenberg Alpine pasture. It is a piece to call the cows for milking. Hugo Zemp did a lot of scientific research about the subject and made some documentaries (references here, here, here and here). Four Jüüzli was recorded during milking in a cowshed. Why not begin with a little yodel lesson ? I could use the one by Cathy Fink but it is easy to find on The rough guide to yodel. So this is an older song, from the fifties I suppose, and hundred of artists have recorded this song around the world since then. The original version of She taught me to yodel is from Elton Britt, a yodelling jazzy cowboy crooner. I couldn’t find any recording date, just the number on RCA Victor (20-3092), but I suppose it’s from the end of the forties or the beginning of the fifties. He demonstrates here his ability to sustain rapid voice-breaks. Other songs where he’s at his best will come soon. Kenny Roberts, Britt’s protégé, did a more exuberant version in 1953 on the Coral label, he was encouraged by him to learn the song and make it evolve. It become a world wide hit in 1962 when Frank Ifield, an australian english country and easy listening singer, recorded it, still influenced by Britt. He made it a yodellling virtuoso piece with the final verse sung at double-speed. More versions to come. and to end, a nice clip from Diane Jewitt (no info about her) recorded in 1959 at Town Hall Party. I suppose it comes from the dvd edited by Bear Family. It’s the same song, with a little difference: He taught me to yodel. You are currently browsing the Mademoiselle Montana's Yodel Heaven blog archives for April, 2008.